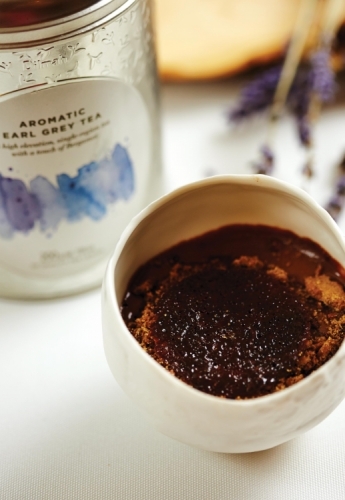 Infuse the milk with the Original Earl Grey overnight (12 hours). Whisk the yolks with the sugar and a pinch of salt. Cook in a small saucepan with the infused milk. When it reaches 80°C, remove from heat, and pour over the Manjari chocolate. Allow to cool, whisk the cream until it holds soft peaks. Fold the cream into the chocolate and fill it into piping bags. Crush cacao nibs in the mortar. Combine the flour with the rest of the dry ingredients, add the butter. Place it on baking paper, bake at 180°C for 10 minutes. Bring the water to boil with sugar, glucose, and isomalt. Melt chocolate over a bainmarie, pour the liquid in, add xantana. Lay the mixture on a silicon sheet and bake at 130°C for 30 mins.